Falling headcounts, margin pressures, looming debt, and extended revenue cycle costs weighing on sector. Underperformance amid growing negative scrutiny in the healthcare sector signals shifting sentiment. Medicare-for-all movement continues to gain traction heading into 2020 elections. Could healthcare be the epicenter of the next systemic contagion? President Trump's political agenda seems to align with a bearish outlook on the healthcare sector. President Trump, according to Bloomberg News, has backed down from a healthcare debate until next year's election. The first-term President failed to repeal and replace the Affordable Care Act "ACA" in the summer of 2017. Trump has executed a reasonably clever, stealthy strategy in conjunction with Republican leadership - crafting reforms and issuing executive orders that have left many wondering if Obamacare even still is in existence. However, could an organic need to reconstruct our healthcare system present itself sooner? Is it possible that Trump, a leveraged buyout expert, who indeed learned his over-leveraging lesson in the early 1990s could see something many don't? There's one lens in which it certainly appears so and his 2016 platform appears to align. Unlike President Clinton, President Bush, and President Obama, President Trump has mostly stripped the health care system of federal funding and mandates. Meanwhile, many investors and strategic firms have been using leverage as the modus-operandi in which to capture that funding. The banks continue to extend loans into healthcare despite the cancellation of the Obamacare subsidies as well as the individual mandate. If you want to find a way to offset your high healthcare costs, cash-in on the bull market! Undoubtedly, that would be one way of doing so, as that's precisely where the money has gone. Moreover, healthcare is an economic sector, so large and so leveraged, that it is volatile enough to affect far more than just investors. 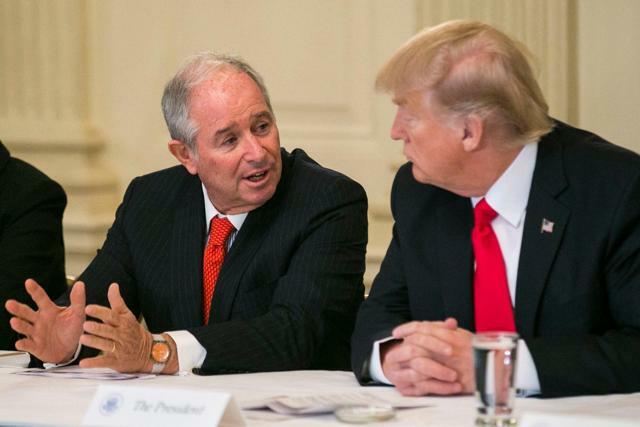 President (right) with Blackstone's Stephen Schwarzman (left). Source: The New York Times. As one that understands healthcare's very complex reimbursement system, as well as finance, I can say my understanding of leverage-use grew with experience. My previous business, a community mental health counseling roll-up strategy, provided for better outcomes in an area of unproven science. The constant follow up and individual attention attracted insurer contracts that, dollar-for-dollar, hour-for-hour, provided immense value from a reimbursement perspective and a patient-wellness point-of-view. In under three years, the entity was bought-out, early, but according to plan. These microscopic models were small businesses and just a little scaling was enough to show value. Thus, when acquired by a global private equity firm - the question for a serial entrepreneur, was, what next? The next step was to try and execute the strategy in a more research focused manner that allocated capital to a diverse market with plenty of fragmentation - the chosen area: the Bay area of California. However, with the "ACA" debate looming in Congress in 2017, and in the process of exiting one business and simultaneously evaluating the strategy for another: a fortunate epiphany revealed itself, a looming systemic risk. Asset valuations were growing and the ability to over-leverage assets in the healthcare sector was effortless. Access to debt dollars was virtually available to anyone wanting to get into the game. So long as you had an LBO model with free cash flow, a growth plan, and "quality of earnings" report, you could acquire with ease. Quite frankly 2011-2015 was an exceptional growth period for what is supposed to be a competition-limited industry with prohibitions on the corporate practice of medicine. We've tried to do this by coming up with a proposal behind closed doors, in consultation with the administration, then springing it on skeptical members, trying to convince them it's better than nothing, asking us to swallow our doubts and force it past a unified opposition. I don't think that is going to work in the end. And it probably shouldn't. For more color, watch the very telling video below. John McCain and the "skinny repeal." Source: Huffington Post. Behind closed doors? In consultation with the administration? What could this mean? Well, for one, Mr. Trump has been fiercely working to place China in check with tariffs, using propaganda and the iron curtain of communism to his benefit. If the President sees a correction coming, then it's fair to say that tariffs, along with diplomatic visits to men named Vladimir Putin and Kim Jong Un seem reasonable. They would appear as pre-emptive tools in which to ultimately drive down the costs of our sovereign credit obligations. Moreover, The Trump Organization stopped using debt and focused on a cash-based business over a decade ago, according to the Washington Post. This idea follows the proven thought line that humans are time-inconsistent and that our future selves cannot be trusted. Could McCain's concern be more of an economic one? Was McCain hoping for de-escalation and Trump hoping for immediate reconstruction, ground up? The tempered McCain often favored de-escalation over partisanship. Additionally, the skinny repeal was a political nunchuck that was rolled out very quickly and swung left. It could have undoubtedly triggered a mass exodus of debt players from the healthcare system, nearly two-years ago. He indeed came back to make a statement and President Trump made clear on Twitter that he felt they were on the same page. boy oh boy, they've been working on that one for seven years (sigh), the swamp. Again, what was the discussion behind closed doors? It sounded like President Trump wanted to rip the band-aid off with any type of catalyst possible, and Senator McCain wanted bi-partisan de-escalation. The loans from 2011-2015 were predicated mostly on unrealistic revenue streams. The Nasdaq Healthcare Index has outperformed the S&P 500 index by a whopping 94% from January 1, 2013, to until August 5, 2015. Then, since, the health care system has underperformed, dramatically. As for the S&P Health Care ETF, it is seen below for the same time periods. Significance, anyone? What was the tipping point? 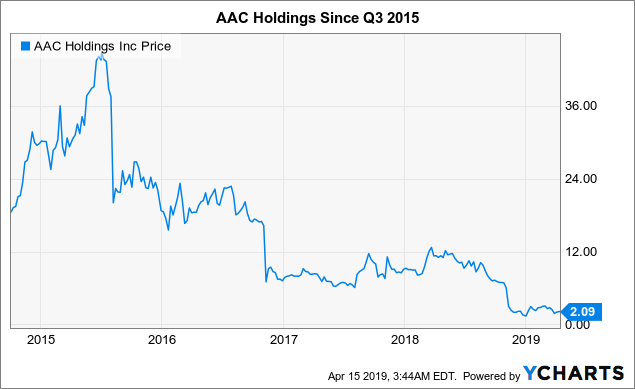 Some say consumer reports and China; however, on August 4, 2015, a fellow contributor's report from BleeckerStreet Research had rocked the markets when tiny Brentwood, TN-based health care company, AAC Holdings (AAC) collapsed by roughly half its value. 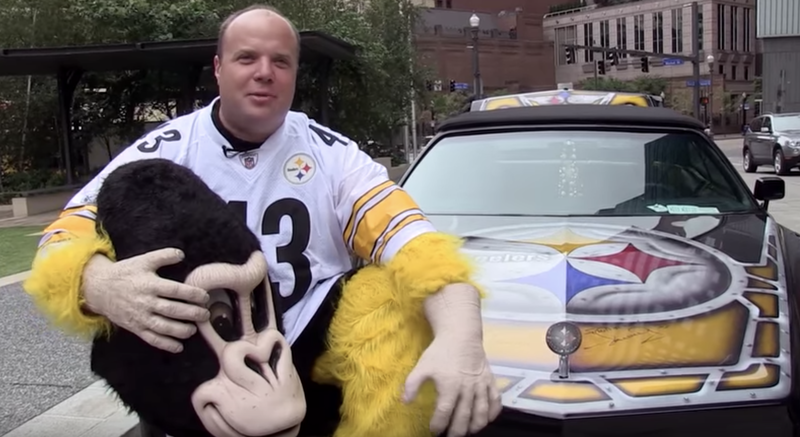 President Jerrod Menz (the man below dawning a Gorilla suit), along with the corporation (allegedly dealing in over-billing for urine-based drug tests) was indicted for murder. American Addiction Centers Former President, Jerrod Menz. Source: Open Throttle 360/YouTube. Today, AAC Holdings has reduced to near-rubble amid a federal investigation. This morning they released earnings and missed EPS estimates by a penny, causing shares to sink back under $2. The murder charges, ironically, were brought by the former California Attorney General seeking to replace Mr. Trump in the oval office, and the "ACA" system with Medicare-for-all: Sen. Kamala D. Harris (D-CA). The first public company indicted for murder certainly appears to be the only primary healthcare catalyst in reports from August 2015. The data seems to suggest that the market got weary of abuse, fraud, and ease of access to debt and revenue streams and still has yet to recover. So, I backed out of the deals, read loan-level data, learned new terms such as "unitranche," and tried to decipher if the downside was the right investment strategy. I found market strategist Jea Yu, an expert trader and researcher of public market information, who watches 18 screens from his basement in Rockville, Maryland. Collaboratively, we developed a "contagion map." The map was an overview of a strategy we would hope to implement as a bearish-directional play in healthcare, complete with an event-driven focus. The mental health sub-sector that saw pre-"ACA" tailwinds arrive with the 2008 Mental Health Parity and Addiction Equity Act was the most likely segment to fall first. The next step of attaining services to run a hedge fund with such a focus, from the same banks sponsoring the debt, proved remarkably challenging, and ultimately, we recognized many markers of artificial inflation of U.S. health care interests. 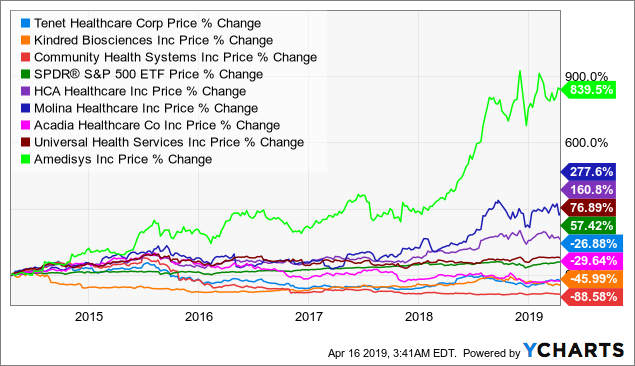 This, so much so, that some healthcare companies like AAC and Community Health Systems Inc. (CYH) appear as zombies, while companies like HCA Healthcare Inc. (HCA) and Molina Healthcare Inc. (MOH) are in a melt-up of nearly 3X and over 5X the S&P, respectively, over the trailing five years. Then, Amedisys Inc. (AMED), over the last 5 years, has beaten the S&P 500 by 14X. Really? 14X?! Yes, see below. In December 2018, it became clear that biotech was also grossly over-leveraged as well and could prove equally as volatile as mental healthcare. However, by that point, we had agreed that this was an impossible task, and the short side had too many risky aspects all on uneven variables in a skewed playing field. Also, companies like Envision, Lifepoint, and Kindred Healthcare have been extracted from the public markets in take-private deals. Envision, for example, was a deal in which Kohlberg, Kravis, Roberts, and Co., (KKR) paid a whopping $9.9 billion for a company that posted a net loss of $1.84 billion for the second quarter of 2018, right before being acquired. Their work to convert to managed (in-network) care is going to hurt margins, and it seems the most feasible rationale for that deal was the management fees. My key "go" or "no-go" for launch in late 2017 resided around buzz out of the White House that the President may cut the Obamacare subsidies. Once he did, it was a "go." I recall how President Trump took a hard stance versus the insurers on October 13 and 14, 2017. The extraction of the individual mandate meant it was a definite "hurry-up-and-go faster." Of course, that all occurred during 2017's pre-Christmas tax overhaul. I have some very wealthy friends. Not so happy with me, but that's OK. Along with paying the debt for health care deals, the same New York Times article pointed to the fact that for Private equity firms will have a harder time making deals overall. However, the President, just hours after the law passed, held a $100k/plate dinner at the home of Stephen Schwarzman of PE giant, Blackstone (BX). Private equity, have you even put two-and-two-together? In healthcare, private equity has been known to embark in some very risky credit obligations secured by the targets they acquire. The riskiest loans are dragged away from the public eye. A unitranche loan, for instance, is something used by private lenders, in conjunction with banks, via business development companies. Capital One Financial (COF) has a division for it, only for healthcare. The concept takes senior debt, and subordinate private debt (mezzanine debt) and combines it all into one note with a blended rate. It's unclear what happens in bankruptcy court as it has yet to face the test. Cynics will say that tax reform was meant to juice the economy for years to come, as Trump appears to let on, or was it? A year later, more was revealed. In December, we all found that the newly minted tax reform also resulted in a lawsuit in which the plaintiffs exploited the fact that the "tax" no longer exists, among other factors that led to a Federal Judge to deem Obamacare an unconstitutional law last December. It's my informed belief and understanding (based on no formal legal training) that due to its politically conservative-leaning nature the New Orleans, Louisiana-based 5th Circuit Court of Appeals is unlikely to reverse the Texas U.S. District Court's decision. This ruling places the Affordable Care Act in jeopardy, adding to exacerbating factors surrounding an overall thesis of insufficient revenue to meet credit obligations obtained under the expectation of various entitlements and unrealistic long-term revenue expectations. Thus, indeed, a good reason to attach the individual mandate to tax reform. At the time, it seemed like another political nunchuck. However, it appears someone had a plan. Despite the tax benefits, the individual mandate's role in tax reform makes more sense. Litigation and loopholes can do wonders in business--and apparently in government too, now. For companies liable to investors to increase margins and return nest-eggs in more significant sum; the concept of for-profit healthcare may seem ridiculous in itself. However, it's not the profit that is the issue. The problem lies within the fact that no federal limits on the corporate practice of medicine compounded with loopholes (created by lawyers to reduce costs to patients) have skewed what was initially intended to be a very regulated and competition-limited industry. The growing scrutiny over shadowy drug pricing policies, profits-over-patients practices, rising deductibles and out-of-pocket expenses, ambiguous billing practices, and budding insurance premiums is reaching a tipping point heading into the 2020 elections. The once Teflon health insurance carriers are seeing share prices tumble even in the wake of record earnings growth as they will be the worst hit under a single-payer system. Critics argue how insurers like United Healthcare (NYSE: UNH) who are mainly middlemen can continue to post record profits amid rising healthcare costs. Incidentally, United Healthcare reported Q1 2019 EPS of $3.73 beating estimates by $0.13 and raised FY19 guidance to $14.50-$14.75 compared to $14.65 previous consensus analyst estimates on April 16, 2019. This resulted in a price gap up to $238.01 that morning, before collapsing back under $220 per share, further evidence of the shifting tide of sentiment in the healthcare sector. Furthermore, high deductible insurance plans (HDIPs) continue to gain popularity, which in essence shifts the payer responsibility to the patients, further fragmenting revenue sources, extending revenue cycles and escalating write-downs for medical providers. 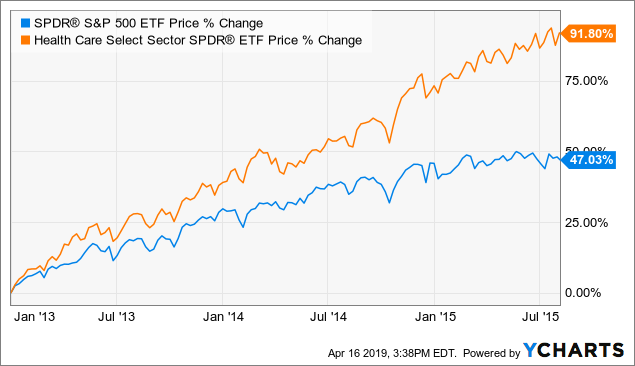 The S&P 500 healthcare sector (XLV) has long been considered a haven for investors primarily fueled by pharmaceuticals, health insurers, and medical equipment makers with top five holdings including: Johnson & Johnson (NYSE:JNJ) at 10.76%, Pfizer Inc. (NYSE:PFE) at 6.92%, UnitedHealth Group Inc. (UNH) at 6.54%, Merck & Co. Inc. (NYSE:MRK) at 6.00%, and Abbott Inc. (NYSE:ABT) at 3.54%. However, this stronghold of investor sentiment may be crumbling as disruption takes place in the form of the Medicare-for-all movement that seeks to transform the reimbursement infrastructure into a single-payer system, which is the standard for most nations around the world. The compounding plethora of catalysts, regulatory/policy uncertainty, credit risk and growing negative consumer and investor sentiment may be signaling a looming healthcare crisis is upon us. 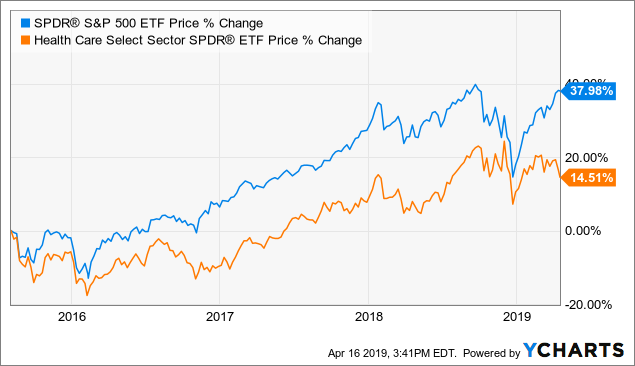 With the year-to-date (YTD) underperformance of the XLV ETF up only 4.4% compared to up 16.67% for the S&P 500 as of April 15, 2019, Mr. Market may be thinking the same thing. Hypothetically, if there is a correction, in healthcare, or any other sector that leads to subsequent deleveraging; then the highly inflated health care sector with unfathomably high costs-of-goods-sold will prove to be affected most. Debt defaults and bankruptcies could spread contagion throughout the sector triggering medical care and supply shortages as facilities shut down. The affected U.S. citizens will be undoubtedly distraught when a loved one is unable to receive even the most basic life-saving procedure due to a supply shortage leading to a potential crisis scenario where, unlike 2008 when people lose homes and pensions, we can add lives to the list. From the lens of hypothesizing that the President is banking on a healthcare crisis, it seems to bode well for him. He's not a politician; he's avoided supporting nearly all aspects of furthering the healthcare asset inflation and done everything possible to pull the curtain on the system. It's doubtful that we will trust the government with our healthcare when it happens, not if. Thus, if it collapses before November 2020, Trump could be cashing in on a big bet, with plenty of political capital in-hand.